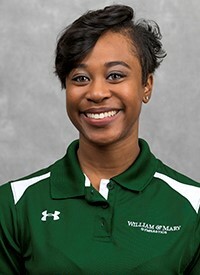 Kelsey Hinton enters her fourth season as an assistant coach with the William & Mary women’s gymnastics team. In addition to being instrumental in all aspects of the program, she also serves as the recruiting coordinator. Tribe gymnasts have benefited from Hinton’s tutelage during her three seasons in Williamsburg, as the team has posted three top-three finishes, including two runner-up efforts, at the Eastern College Athletic Conference Championship. Additionally, W&M standouts have combined to win seven ECAC individual titles and 21 all-conference honors during the last three seasons. Last season, W&M placed second at the ECAC Championship by posting the sixth-best score in school history. The impressive showing marked the fourth time in the last five seasons that W&M has placed first or second at the league championship meet. Another highlight came in the victory against West Chester when the Tribe set a school record on bars (49.125) and posted the third-best team total in school history (195.100). Individually, Katie Waldman and Taylor White qualified for NCAA Regionals as all-arounders, while Waldman won conference title in all-around and on bars. Madison Dwyer also distinguished herself by being selected as a ECAC Scholar Athlete of the Year. In 2017, the Tribe placed third at the ECAC Championship, as senior Briana Gironda highlighted the team’s individual performances by winning the beam title with a career-high 9.875. The impressive score ranked tied for seventh in school history in the event and was just 0.25 shy of the best score ever earned by a W&M gymnast at the conference championship meet. Gironda also garnered all-league honors in all-around, as she combined with three other Tribe gymnasts to win five all-league honors. Additionally, the team continued the program’s long tradition of excellence in classroom, as 13 gymnasts were selected to the ECAC All-Academic Team and 10 earned NACGC Scholastic All-America honors. W&M experienced tremendous success during Hinton’s first season with the Tribe in 2016, as it came up just shy of earning the program’s third-consecutive ECAC title by tying for second at the league championship meet at Kaplan Arena. Brittany Stover highlighted the Tribe’s individual accomplishments was selected as the ECAC Athlete of the Year for the third straight season and placed 12th in all-around at the NCAA Athens Regional. Additionally, Tribe gymnasts combined to win four ECAC individual titles, while 11 gymnasts were selected to the ECAC All-Academic Team. Highlighting the regular season was an exciting dual meet victory against North Carolina on Senior Day at Kaplan Arena. W&M has also excelled academically during Hinton’s tenure and earned 24 ECAC All-Academic Team accolades (2015-17). A four-year all-around competitor at North Carolina State (2004-08), Hinton joined the Tribe staff after serving as the Class Program Manager and Girls Team Coach at Kidsport Gymnastic Academy in Burlington, N.C. During her eight-year tenure with the Academy, she was responsible for a wide range of duties that included creating practice plans, providing private lessons, evaluating talent, overseeing various special projects and managing the building. Highlighting Hinton’s accomplishments at KGA was being honored as the 2015 North Carolina Coach of the Year. In addition to Hinton’s work at KGA, she has served as a camp counselor at N.C. State since 2006 – seven years as a master staff member – and worked as a recruiting consultant at College Prospects of America from 2011-12. Actively involved in the community, Hinton has volunteered with the American Diabetes Association, Habitat for Humanity and promoted African American issues awareness. Hinton graduated from N.C. State with a bachelor of science degree in sport management in 2008.